There is an old carpenter’s axiom, ‘measure twice, cut once’. The lesson? Careful, informed planning is essential to ensure a positive outcome. Hurry to complete a project, and you do so at your peril. A lot of wasted wood cut just a skosh too short. Ideally, Ergonomics should play a central role in the design and build out of any building where people will work. Understanding the needs and limitations of the human body at rest and in movement should inform the work of architects, designers and builders. Have you ever worked in a business environment where the building structure, layout, space allocation for job tasks, movement & pass-through, while up to all current day building codes, seems to interfere or impede productivity? The workspace allocated per employee in office environments is often driven by cost issues (cost per sq foot), rather than building an understanding of the tasks employees would be asked to perform….THEN DESIGN TO MEET THOSE NEEDS. Or, perhaps the business, like most, have gone through significant expansion in their use of technology. New tools are forced into existing environments; this reality introduces risk factors into the workplace. Or, the employer needs to support as many workstations in an area as possible, with little or no regard for human factors and ergonomic realities. (think CALL CENTER – have you ever walked through a large call center – YIKES – an MSD factory). or at least 12% leaving the profession, many with permanent disabling injuries. The rate of Musculoskeletal Disorders or MSDs in healthcare workers exceeds that of workers in construction, mining and manufacturing. 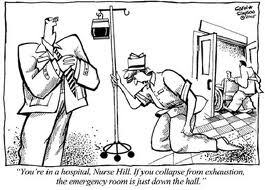 FATIGUE – Nurses walk 1/3 of every shift due to poorly designed floor layouts and inadequate storage at the point of care. A nurse walks more than 6 miles per shift. TECHNOLOGY – New technologies have transformed healthcare; unfortunately, many of the nation’s hospitals were built before the invention of computers. Tools and technology is crammed into every nook and cranny on patient care floors. Nurses spend HOURS at computer workstations that are poorly designed, forcing out of neutral body postures and increasing the risk of MSDs. EMPLOYEE SAFETY NOT A PRIORITY – Present day hospital culture is about PATIENT SAFETY concerns and conversations; employee safety is a distant second. 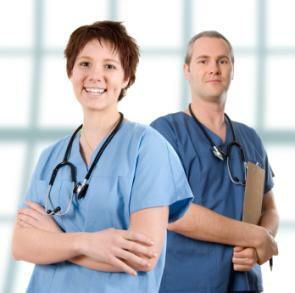 The typical hospital will have a Patient Safety Officer, with enterprise level responsibilities and resources. That same hospital will relegate Employee Safety responsibilities to any number of ‘owners’ at the middle management level. per shift. Longer hours, more shifts, less down time. Intelligent hospital design, leveraging human factor and ergonomics expertise would alleviate MANY of the factors listed above. Lifting tools and technologies exist that could eliminate injuries due to heavy lifting. Floor plan design must evolve to eliminate unnecessary walking that contributes to fatigue, then injury. Technology can be better integrated at the point of care, with ergonomic solutions to minimize MSD risk. Any design must have adaptable, changeable and flexible enough to meet accommodate changes in technology. Ergonomics must be one of the guiding principles in future hospital design. Let’s not ‘assume’ that Ergonomics is central to the design methodology….DEMAND IT. Make sure the development teams have MEASURED TWICE…before they finalize design. The costs of business as usual are too high. Have something to say on this topic? Please add your comments.